The icosahedron is a fantastic shape and one of the most common platonic solids. It has 20 sides and 12 points… I know, geometry… BORING! Bear with me. The icosahedron occurs naturally all over the place. From the distribution of of dandelion seeds, to natural crystalline formations all the way down to the shape of the “head” of viruses. It’s so common because it’s so stable. These shapes are fun too! In fact, they’d make an excellent building toy for kids (or adults!). Yet all of the building toys that kids play with are based on rectangles. This is great for introducing children to the fundamental forms of man-made architecture, but what about the fundamental forms of nature? Here’s the problem. The natural formation of icosahedrons is typically the result of self-organizing chemical or atomic bonding. Building toys for children are too heavy. Gravity becomes the dominating force and children must rely on stacking to create stable structures, as with building blocks. Legos took building a step further. They still rely on stacking, but the innovative snap-together mechanism allowed for new and fantastic ways to build. Gravity became much less of a concern when blocks actually connected together instead of just resting on top of each other. Like Legos, IcoBlocks would require some kind of bonding mechanism that helps them defy gravity and imitate chemical bonds. A 20-sided lego brick might do the trick… but even forgetting about male-female coupling conflicts for a minute, the shape itself would defy todays most advanced injection molds. Sounds like a perfect job for 3d printing to me! 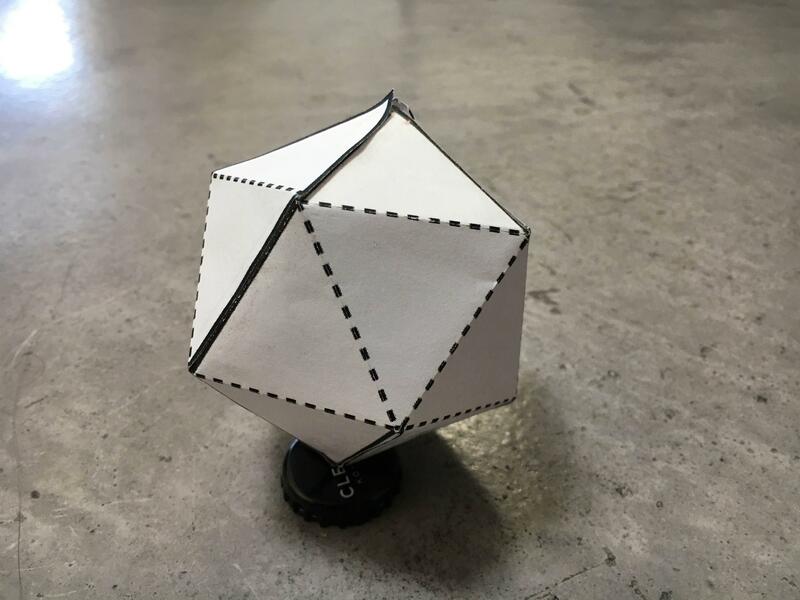 The bonding mechanism can be achieved by inserting spherical magnets at each of the 12 points of the icosahedron. A 3d printer can also generate this cavity properly. Taking advantage of the material elasticity, the insertion point at each tip is just large enough to press the magnet inside during assembly, but just narrow enough to prevent the magnet from escaping. The cavity itself is also large enough to allow the magnet to freely rotate, ensuring a quick bond regardless of polarities. One of my earliest IcoBlock prototypes. This is an open project and I’m looking for collaborators who can help me finish the 3d-printable model. The final design would be open-source so anyone can print, play, modify and build cool stuff with their new IcoBlocks. And of course, full credit to everyone who contributes. Teamwork makes the dreamwork! Let me know if you want to help! Here’s a science project with a similar challenge. They are building realistic models of molecules that are magnet-powered. 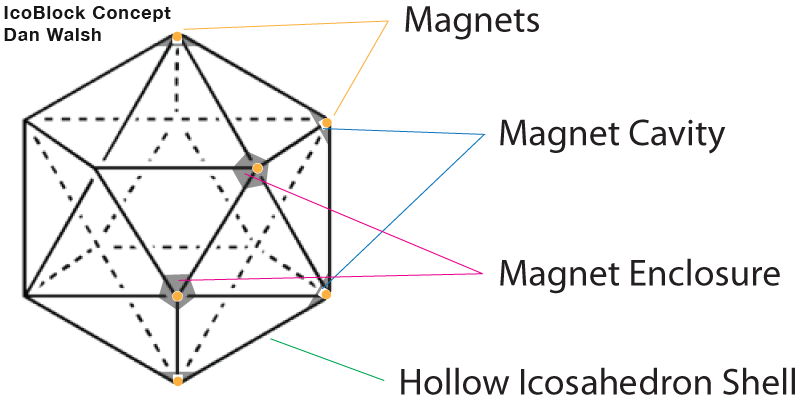 The magnets mimic the actual interactions and shapes that molecules take. Thanks for the resources T!